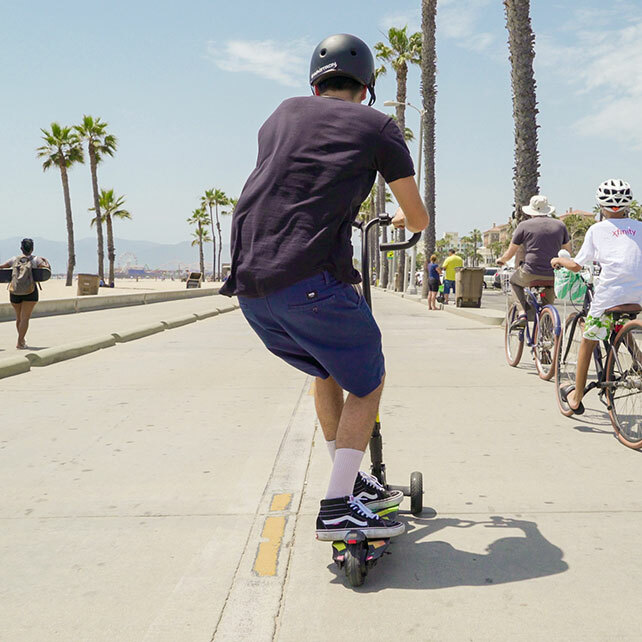 Cut, carve & coast with the revolutionary Cali Drift folding three-wheel electric scooter. 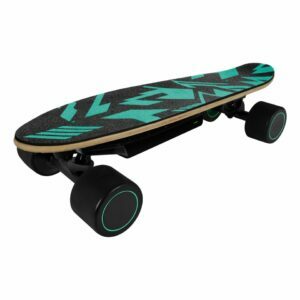 That feeling of carving on a skateboard with the power and stability an eScooter. 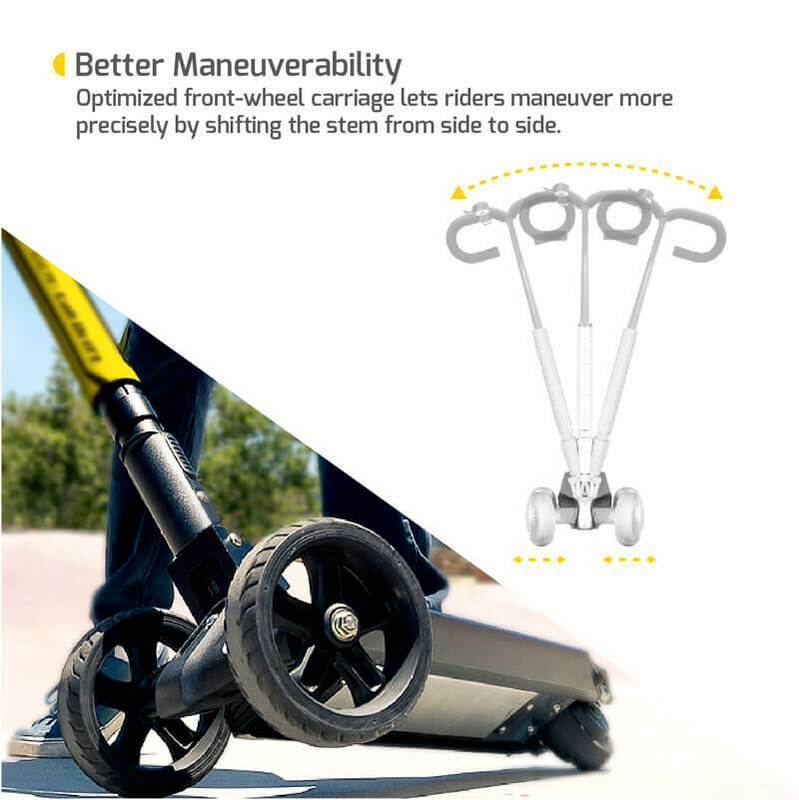 Cut, carve and coast with improved stability, smoother ride, enhanced control and better traction. 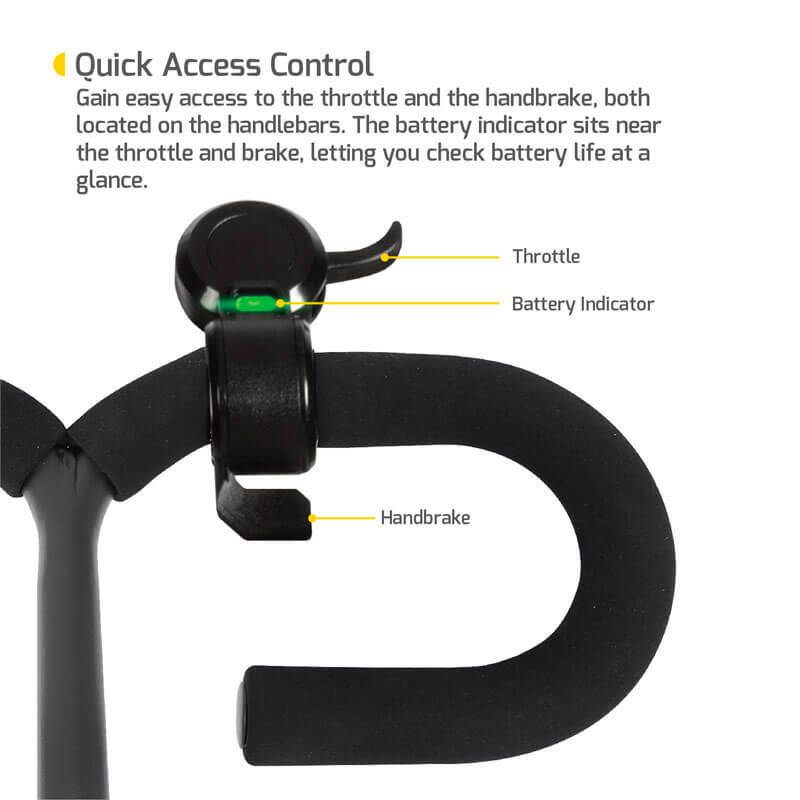 Grip the adjustable U-shaped handlebars and shift the stem from side-to-side to maneuver with precision. 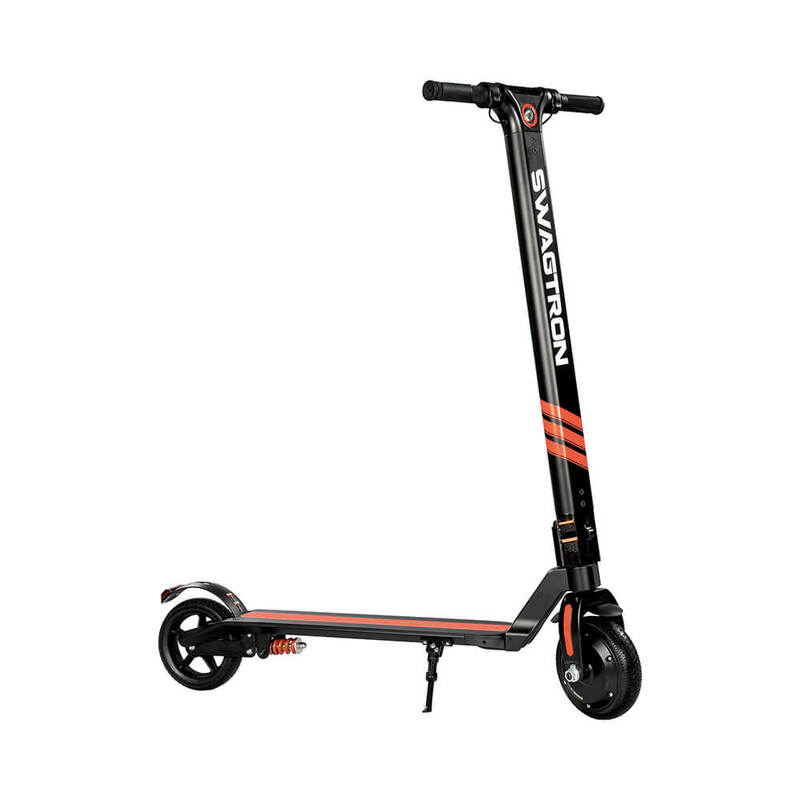 The fold-and-go, reinforced aluminum-alloy frame weighs just 22 lbs and supports riders up to 264.5 lbs. 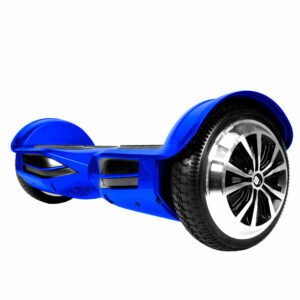 Unleash your inner adventurer with the Cali Drift three-wheeled electric scooter from Swagtron. 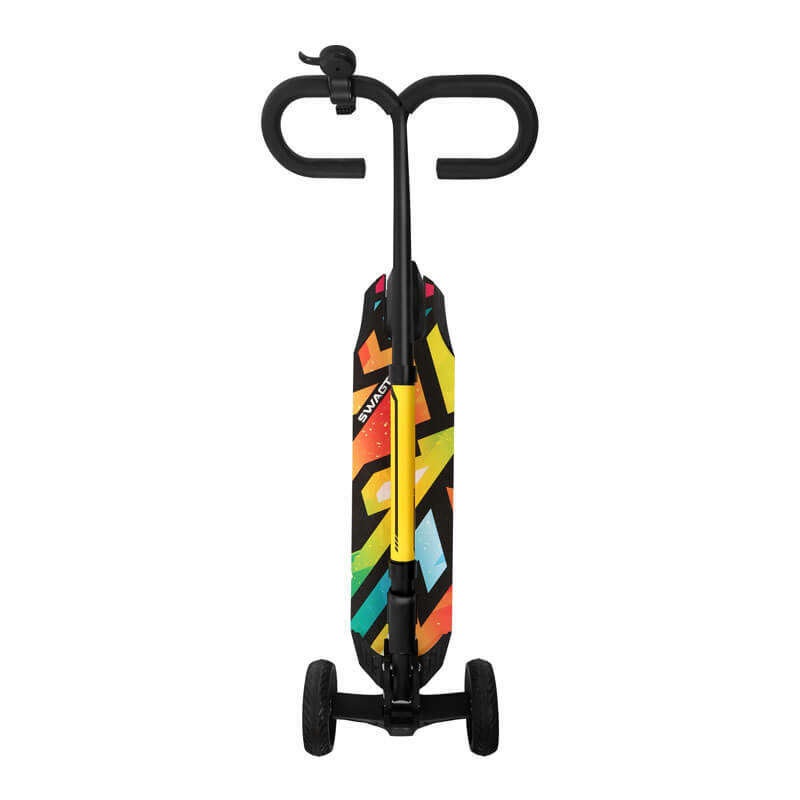 With a powerful 250-watt motor and three-wheel design, you’ll be able to cut, carve, and coast to your heart’s content. 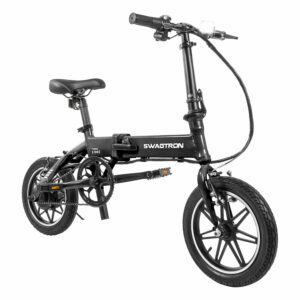 Cruise around town up to 15.5MPH. 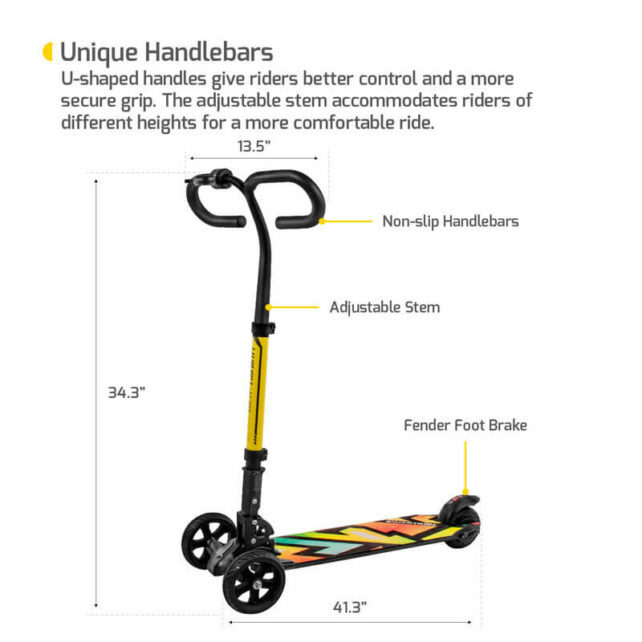 Maneuver with unparalleled ease through narrow sidewalks and crowded boardwalks. 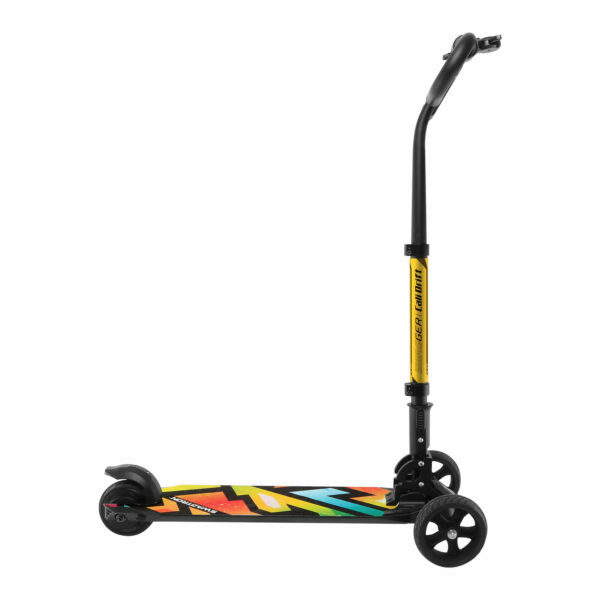 The Cali Drift’s U-shaped handles and deck design means you’ll outclass everyone else while drifting with style. 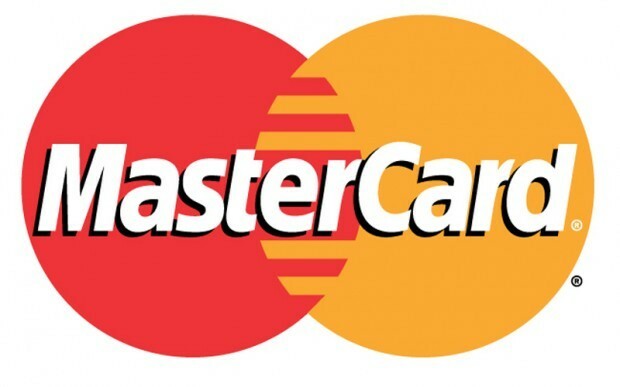 Enjoy total control. Accelerate with the Cali Drift’s thumb throttle. Or brake as quickly as you need with either the handbrake or footbrake. 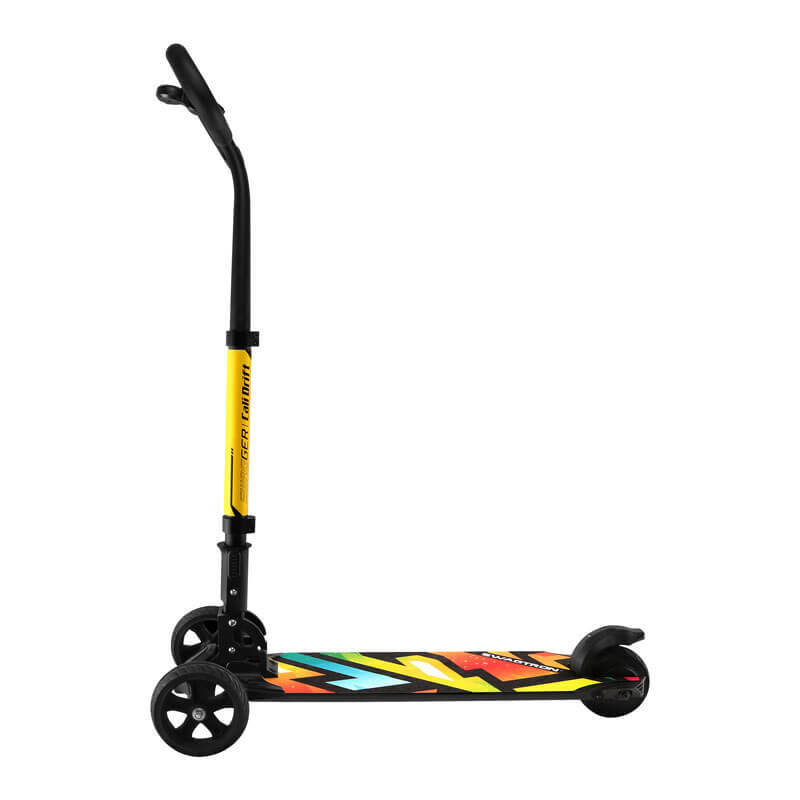 Hard rubber wheels give the Cali Drift a smooth ride. Cruise as fast and as hard as you like. 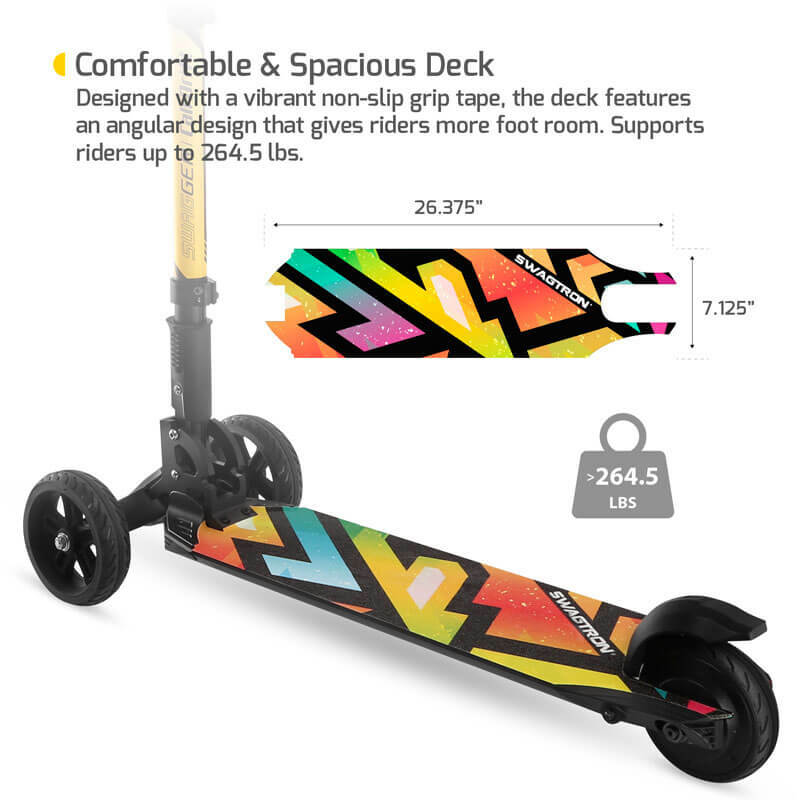 No matter how fast you coast, you’ll stay securely in place with this e-scooter’s no-slip deck. 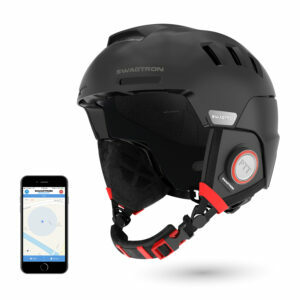 Race ahead of the competition. 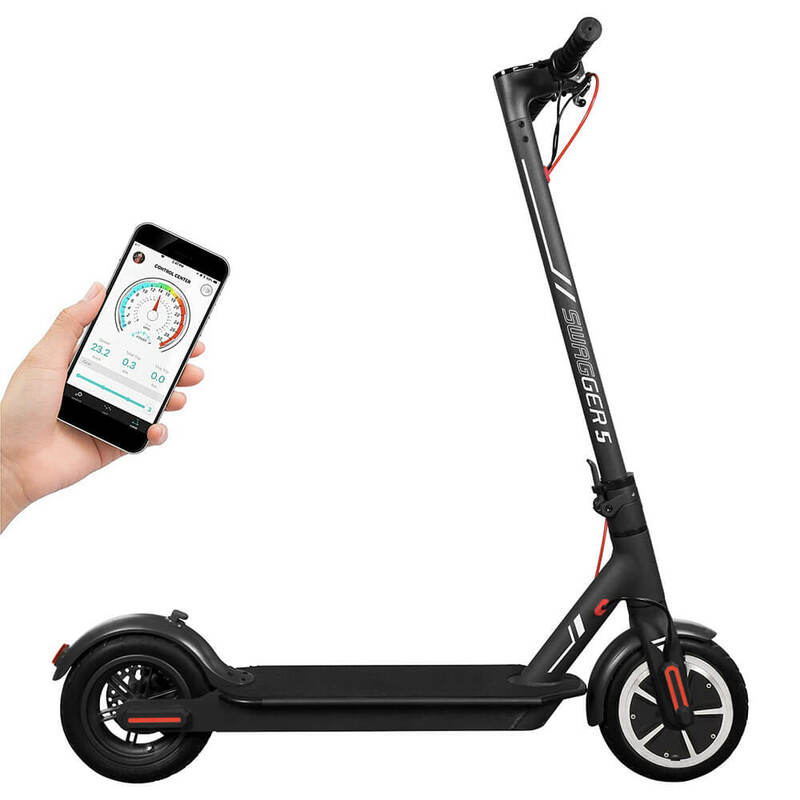 The Cali Drift’s lithium-ion rechargeable battery will last up to 9.3 miles on a single charge. 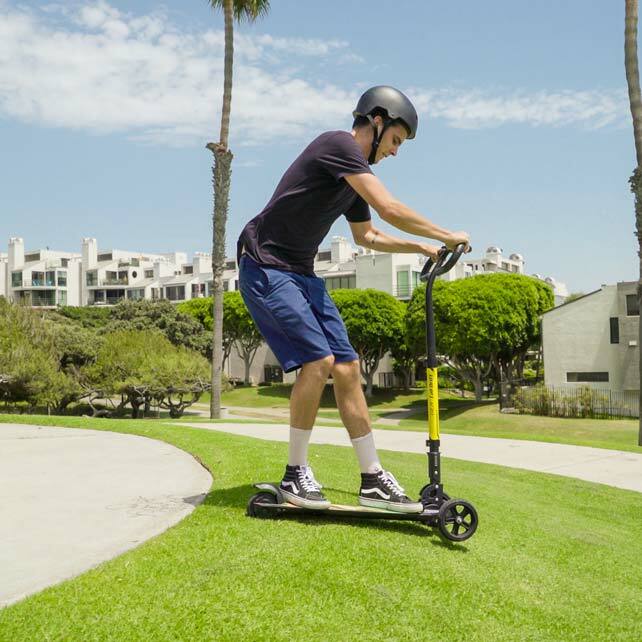 Fully recharge the three-wheel e-scooter in just 2.5 hours and get back to your adventure. 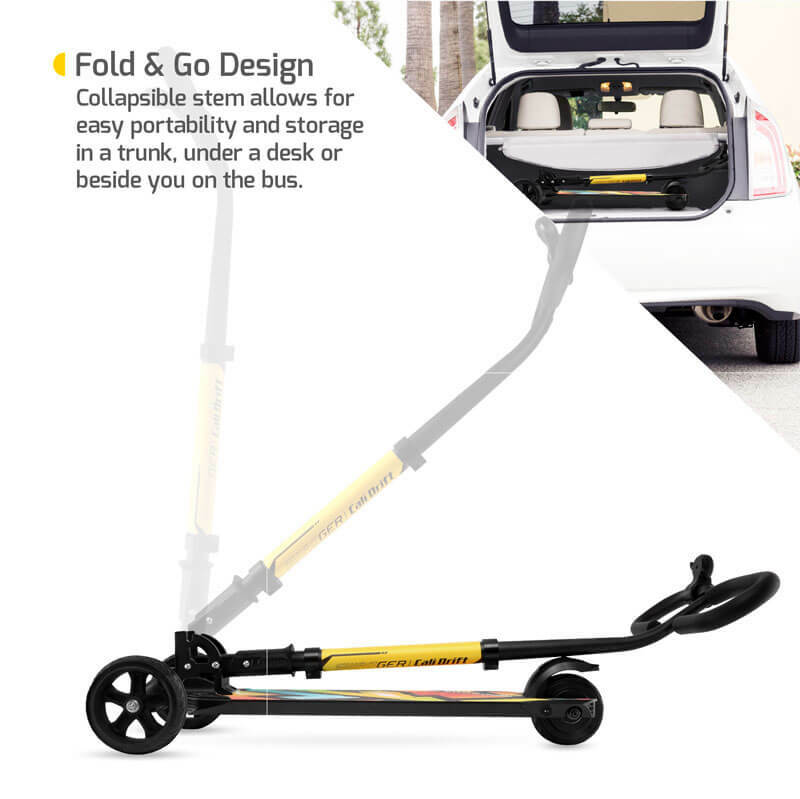 When you’re ready to take a break, simply fold up the scooter and store it away while you plan your next ride. Go harder. Coast longer. 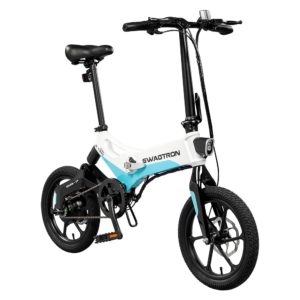 Cruise farther than ever before – with the Cali Drift folding electric scooter from Swagtron.